Here’s what’s up in the world of television for Sunday, November 16. All times are Eastern. Once Upon A Time (ABC, 8 p.m.): It’s no longer part of the regular rotation, but we are trying to keep tabs on Storybrooke whenever OUAT does something notable—something like a dual-episode, two-hour event that pits Frozen sister against Frozen sister. Don’t make Gwen Ihnat choose between Anna and Elsa, show! Can’t we all just “Let It Go” together? Brooklyn Nine-Nine (Fox, 8:30 p.m.): Thanksgiving setting, Jake in charge, an episode titled “Lockdown”—looks like we have a bottle show on our hands, people! Bottle Show Protocol has been initiated, and LaToya Ferguson will contact each of you with individual instructions. The Walking Dead (AMC, 9 p.m.): Apparently there’s a critical conspiracy behind The Walking Dead’s recent uptick in quality. But what that Variety item fails to note is that Zack Handlen is also enjoying the show for the first time in years. And what good are all Zack’s new, ill-gotten Conspiracy Bucks™ if they don’t earn him notice in the pages of showbiz’s premier trade publication? The Simpsons (Classic) (3 p.m.): Greetings, friends. Do you wish to look as happy as Erik Adams? Well, you’ve got the power inside you right now. So, use it, and send $1 to Happy Dude, [address omitted]. Don’t delay, eternal happiness is just a dollar (or one reading of Erik’s “Lisa’s Date With Density” review) away. Jeff Dunham: All Over The Map (Comedy, 9 p.m.): Not content with peddling his ugly, hate-spewing ventriloquism in the United States alone, the guy with Achmed The Dead Terrorist on his arm takes his puppets on a five-continent tour. What better way to improve Americans’ overseas reputation? Dogs Of War (A&E, 10 p.m.): Tonight’s feel-good hour: The time-slot premiere of this docuseries, which follows a nonprofit organization that pairs service dogs with war veterans suffering from PTSD. The Lego Movie (HBO, 7:15 p.m.): “Everything is awesome!” There, now that song is stuck in your head, and the only known way of dislodging it is watching 2014’s biggest blockbuster surprise. Angels And Ornaments (Hallmark Channel, 8 p.m.): Cast out from the Ryan Murphy kingdom, Jessalyn Gilsig emerges from her Vikings stronghold to play a Hallmark original film protagonist who—SHOCKER—learns a lot about herself and love in the lead up to Christmas. Home Alone (TBS, 8 p.m.): Speaking of the leadup to Christmas: The Christmas season hasn’t truly started until one cable channel or another stages the traditional lighting of Joe Pesci’s head. Sunday Night Football: Patriots at Colts (NBC, 8:20 p.m.): The Patriots and Colts are both coming off a bye week, so expect both teams to play a little snoozy this week. Like, maybe Tom Brady will have accidentally put on mismatching socks, or maybe Ahmad Bradshaw will still be wiping the sleep out of his eyes as he emerges from the huddle. The A.V. 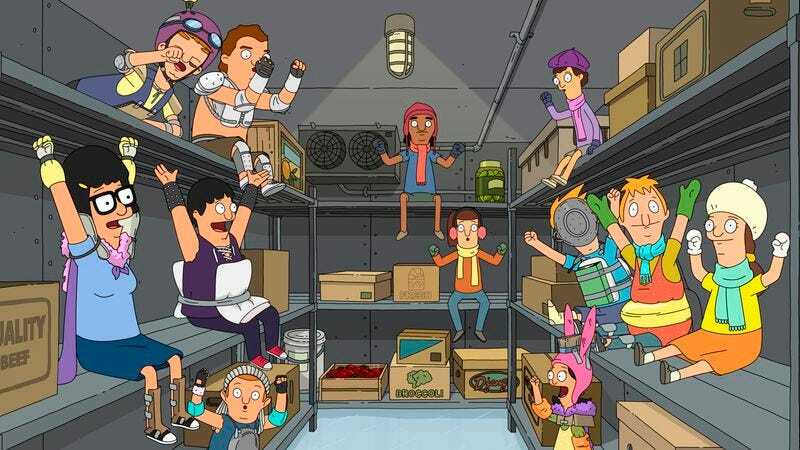 Club wields its immense and unquestionable power to complie an Inventory of shows that would’ve been better as one-season wonders. If any of the shows mentioned in that list manage to make it out alive, perhaps Wiki Wormhole’s take on fictional poisons will knock them back to single-season status, where they belong. Aaliyah: The Princess Of R&B (Saturday): Sometimes Aaliyah was goody goody, but the late singer’s family thought this Lifetime biopic was naughty naughty. Read Joshua Alston’s review of the film to find out where his opinion lies on the goody goody/naughty naughty scale.